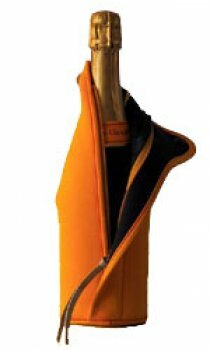 The perfect alternative to an ice bucket, the Clicquot Ice Jacket comes with a 75cl bottle and fits like a diving suit, keeping the Champagne cold for up to 2 hours. In their distinctive Clicquot yellow colour, this uniquely constructed neoprene jacket is as soft and as light as a feather with top-stitched seams, leather trimmings and a convenient zipper closure. Slip the pre-chilled bottle into the chic Clicquot Ice Jacket and enjoy the freedom and elegance of taking your bubbly wherever you go: the beach, a picnic, for a moonlight stroll.